I built my law practice focusing exclusively on helping individuals and businesses in financial distress through bankruptcy. My clients often want to know how they should handle burdensome debt obligations and get a fresh start toward a better financial future. I have helped thousands of clients overcome mountains of debt in my career and I regularly counsel clients facing foreclosure, garnishment & collection cases. I also assist consumers and businesses with asset protection planning to ensure the things they value most are safe. Brent attended the University of Missouri-Kansas City School of Law. While in law school, he competed in bankruptcy moot court in New York City and interned with the Chief Bankruptcy Justice in the Western District of Missouri. Brent was the youngest and fastest named partner in the history of Wagoner Maxcy Westbrook, PC, the largest bankruptcy firm in Kansas City at that time. He has since moved to the St. Louis area to be closer to family and strike out on his own. Brent created Westbrook Law Group, LLC in 2011 with the goal of advocating for the rights of the financially distressed. He has been asked to speak to both attorneys and the judiciary about changes and specific practices in bankruptcy law. He has taken his knowledge obtained in over a decade of practicing exclusively bankruptcy to author a book titled: Defeat Debt & Unburden Your Life, which teaches consumers how to protect assets and remove the fear and anxiety of debt. 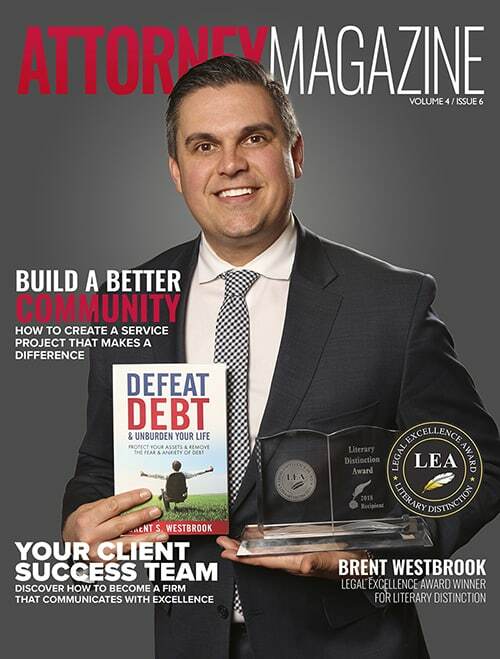 Brent is the only bankruptcy attorney in the St. Charles and Lincoln County area that has been named a SuperLawyer Rising Star 3 years in a row, is Better Business Bureau accredited, and has consulted with Time Magazine on an article relating to the recession and foreclosure crisis. Brent resides in Lake Saint Louis with his wife and daughter and has offices in St. Charles & Troy to better serve you.